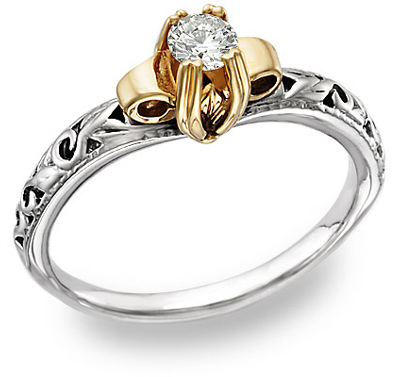 14K Two-Tone Gold Art Deco 1 Carat CZ Ring. We individually hand-set each ring using only high quality cubic zirconia stones that are difficult to distinguish from diamonds. Set in a quality setting that was originally crafted for a diamond ring, this quality art deco cz ring is made to look like a natural, authentic diamond ring! A swirling flower and petal motif is delicately etched into the smooth 14k white gold. An intricate, lustrous yellow gold lotus flower opens to a brilliant, quality cubic zirconia stone of 1 Carat Diamond Equivalent. *Ring is only available in sizes shown. Item is eligible for return only. We guarantee our Art Deco 1 Carat CZ Ring, 14K Two-Tone Gold to be high quality, authentic jewelry, as described above.